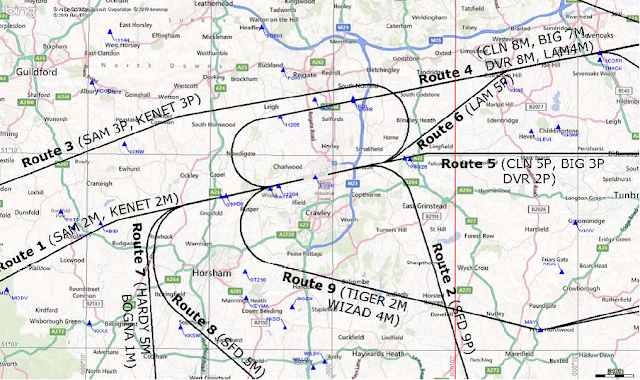 Nutfield Parish is overflown by both Gatwick and Heathrow operations. The flights which have the greatest environmental impact on the parish are departures from Gatwick and we thought it may be helpful to provide some detail of the routes which have developed over the past 3 years, following the use of GPSstyle navigation equipment (P-RNav). The Gatwick runway is orientated east/west. Direction of take-off is mainly based on wind speed. There are nine designated departure routes and we refer below to the two routes which affect Nutfield parish. Route 3 is used when aircraft are taking off from the eastern end of the runway. The aircraft head east to the A22 before commencing an arched turn north and west, passing over South Nutfield and heading west to their destination. This is probably the most intrusive route for many residents. The aircraft height range is typically 3000 to 4000ft. although, on some occasions, large aircraft have been recorded passing over below 3000ft. Route 4 is operated when aircraft are taking off from the western end of the runway. They head west to the A24 and complete an arched turn north and east before passing over south of the village. This route is probably less intrusive for the majority of residents. Whilst most of these flights pass over south of the village, some are routed further north before reaching South Nutfield. In general, flights on this route (4) are at a higher altitude when passing near to the village (usually in excess of 5,000ft). In addition to Gatwick departures, the airspace over Nutfield Parish is also constantly busy with flights from other international airports including Heathrow. These flights are at much higher altitudes usually well over 10,000ft. Nevertheless some do also cause noise intrusion. Airports Commission Consultation - Runway Capacity Jan 2015.